In downtown Silver Spring, Brookfield Property Partners are working alongside their tenants to make big strides in sustainability. According to data from the U.S. Environmental Protection Agency, buildings and industrial facilities generate 45 percent of America’s greenhouse gases and about the same percentage of its trash. Understandably, a green project at home might seem more attractive than one in the workplace. After all, residential projects have fewer stakeholders and moving parts, and can provide more direct and tangible benefits. But if your green efforts stop at your own front door, you’re only working on part of the equation. Businesses and property managers are increasingly recognizing this and seeing opportunities in office spaces, upgrading facilities and engaging tenants and one another on a host of sustainability efforts. 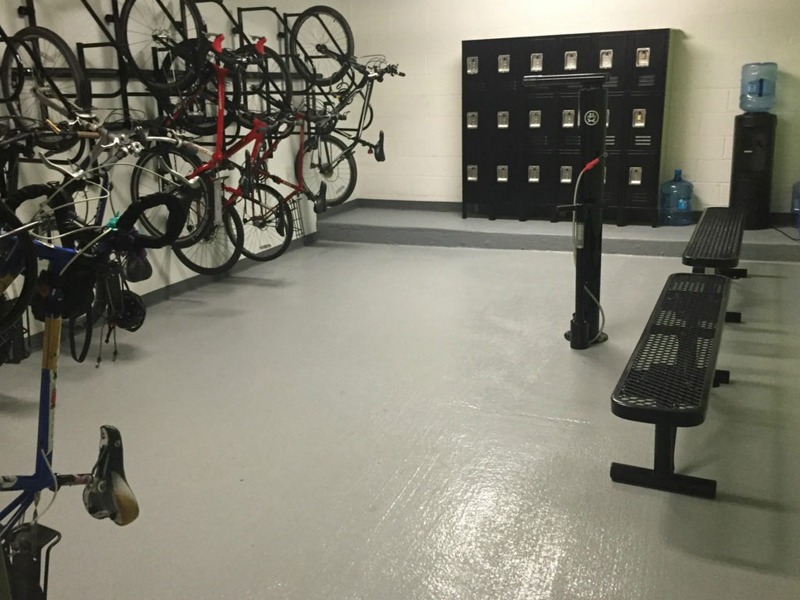 Brookfield’s bike room provides a great space to encourage employees to ride their bikes to work. * “Green teams” comprising tenants, the janitorial vendor, and property managers. 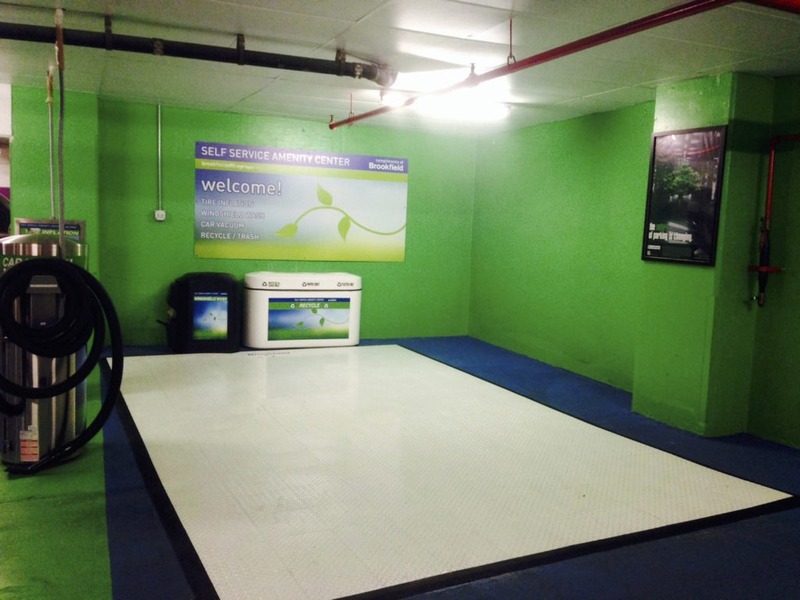 Brookfield’s self service amenity center in their garage is a place that allows employees to inflate tires, recycle items, and more. annual savings of $107,000 and 219,000 kilowatt hours from the lighting retrofits and 125,000 gallons of water from the plumbing changes. The facilities also have streamlined their waste streams. Before the changes, the properties were collectively recycling only around 50 of their trash; that number now sits at at 79 percent. Moreover, the buildings have received LEED Gold certification for existing buildings, and ENERGY STAR® scores have risen substantially, reaching as high as 92, according to Steve Hill, Brookfield’s lead engineer on the projects. But Brookfield managers are quick to point out that going green is a team sport. That’s why they created the green working groups, a collection of tenant representatives, the janitorial team, and Brookfield professionals that meets quarterly to share ideas and discuss sustainability initiatives. “I find that participating in the meetings is helpful, as it keeps me informed about the property managers’ green goals and any challenges that may surface in encouraging tenants to take green actions,” said Jennifer Fields, a green team member and communications coordinator with the Association of Zoos and Aquariums, a Brookfield tenant in Silver Spring. A tenant/community Health Fair event, featuring the Montgomery County Department of Transportation discussing public transit, biking, and other commuting options. For example, Fields noted that, after tenants expressed confusion over which waste items were eligible for recycling, a representative from the Montgomery County Department of Environmental Protection’s Division of Solid Waste Services attended a green team meeting to clarify parameters and goals. That, Fields said, helped foster new understanding (and compliance) among tenants. Of course, this kind of work occurs on multiple fronts. In the beginning, assessing the properties’ trash situation was a pretty messy proposition. That hard work on one end of the equation has been balanced with the ongoing tenant communications and incentives. 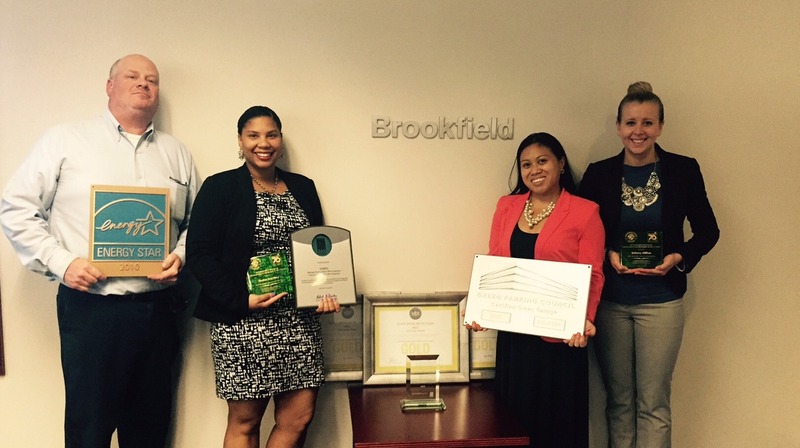 Brookfield managers, for instance, offer a party and “green trophy” for tenants who divert 100 percent of their waste in a given month. It’s emblematic of the symbiotic relationship between property managers and businesses that is critical to moving sustainability in the workplace—and as a whole—forward. By Scott Harris, Freelance Writer. Read Scott’s other posts on the benefits of environmental peer pressure, birds and climate change, eco-friendly ice rinks, residential solar, and congregational rain gardens. Interested in learning how to green your workplace? The Green Business Certification Program has checklists of ways for businesses to go green as well as information on certification programs. Show how green you truly are!